This is the story of a pig, or piggish man, who has achieved power and prestige within an economic and political system that is personified by his secretary/soon-to-be-dictator Elaine Ladentas. In a satire of some of the ‘tune-in, turn-on, drop-out’ stories from the 1960’s, he bails out of his position of prominence, with some hallucinogenic help, and embarks upon a hippie-like existence, free of ‘power games’, while the power of an oppressive society, again personified by Elaine Ladentas, increases. However that authoritarian force is ultimately brought down, not by physical violence, but rather by the soul of Perry, and its surreal interaction with the her dark soul, though he experiences an undercurrent of dependence. “Oink-oink-oink!” sang Perry, he was happy because a multi-million dollar mega-merger had just fallen into place, generously expanding the portfolios of the most influential stockholders with whom he was in contact. “Snort, snort, orngk,” he grunted, as the little green numbers rolled across the screen, nothing but good news. Perry jumped off the swivel chair into the little mud pit below his desk, rolling, grunting, squealing, much to the approval of his secretary, Miss Ladentas, who stood looming over Perry’s mud pit, her shadow casting a pall over the proceedings, blocking out the dim hazy sun framed by the Manhattan skyline. “You’ve done it again, Perry,” laughed Miss Ladentas darkly, “Now sign these,” she shoved a pile of contracts into Perry’s mud pit and he pressed his little hoof into each one earnestly, knowing that his signature guaranteed promise into the lives of millions. However, Miss Ladentas had started to notice a change in Perry’s behavior, and knew she would have to take control of the situation now confronting her. Perry still sat in the mud, but was starting to stomp his little hoof in more haphazard directions. 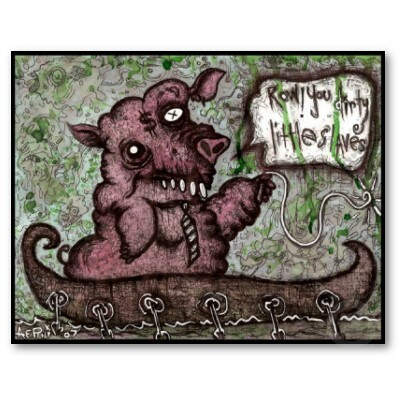 “Oink…flowery paisley sunshine redwood consciousness, happy little madmen spreading their magic wands,” he blurted. Apparently Perry’s slop had been altered inadvertently by the young man from the mail room, leaning over Perry’s desk to deliver microfilmed documents, a tab of hallucinogenic tumbling out of his shirt pocket. Perry trotted out of the building and hopped a cab to Central Park, arriving at a meadow where he instinctively knew where to dig up a little magical uniform, which he slipped, squirmed, slid into, rainbow colors expanding around him. Miss Ladentas knew that the situation was getting out of control. Perry was no longer of use. A pity, as he had shown such promise. He was now out-of-bounds and could not be reined in. “It’s a shame that some are not meant for the great potential for which they are called,” she thought to herself, watching a flower child paint Perry’s hooves a bright purple. However, Elaine Ladentas would go on to bigger things. Years later, Perry was on the bus headed towards the presidential palace. Along the highway were billboards, each one singing the praises of Elaine the Dictator. “Unity=Prosperity!” spouted one, displaying child laborers on a hillside, all wearing boxy shorts, hoeing the dirt merrily. Perry was on a tour of the palace and its grounds, the tour having been carefully pre-planned by the authorities. “Elaine’s home is your home!” screamed the mandatory pamphlet that he was reading. It was to be a much-photographed sojourn through the bowels of Elaine’s government by these randomly chosen citizens. Perry had a strange feeling in the pit of his stomach as they got off the bus and approached the edifice. They were met by a guard who led them through the entrance, where they commenced to follow a yellow dotted line, bounded by red velvet ropes. Perry walked along with the procession as they viewed actors recreating triumphant scenes from Elaine’s dictatorship. As Perry viewed the mini-plays, he tripped on a bump in the carpet, tumbling over the velvet ropes, and through an adjacent door, into the bathroom of Elaine the Dictator. She sat in a tub at the far end, mists of aromatic steam rising from the water, a ceremonial pile of ice slabs in the middle of the room, vaporizations filling the air. The vibrations from Perry’s soul rose, dominated by a past with Elaine the Dictator, a past that can never be spoken of. As Perry closed his eyes tightly, in fear of what may come, Elaine stared deadly at the steam rising from the tub. That steam combined with the vapor of the ice slabs, and with the vibrations of Perry’s soul, resulting in a slowly evolving ‘Chia Pet’ on the tile floor of the bathroom, a little ceramic pig with green sprouting seeds, a devil baby. Elaine the Dictator soon realized that this was not a manifestation of her spiritual goals, and instantly vacated the premises, on all physical and metaphysical levels. Perry moved into the palace digs, and settled in happily, but curiously felt that something was missing. Eric Suhem is in the orange hallway.